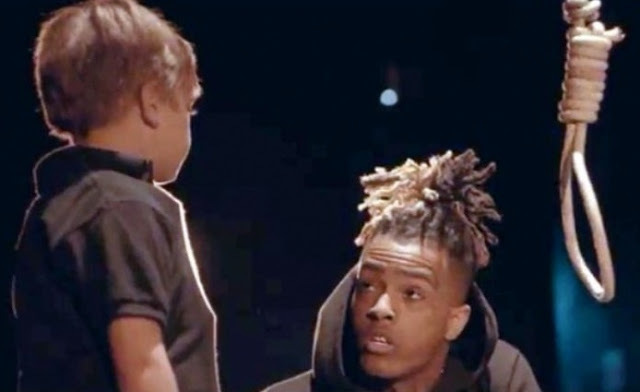 The rapper, who's real name is Jahseh Dwayne Onfroy, drew national attention with his video which includes a scene depicting him hanging a little white boy. Monday, just before 4 p.m. outside a motorcycle shop in Deerfield Beach, Fla., XXXTentacion got a personal introduction to Karma and her sometime companion, the Angel of Death. According to the TMZ, the ghetto rat was leaving a motorcycle dealership when two people in hoodies walked up and put a bullet in his head. He was awaiting trial for aggravated assault of a his then pregnant white ex-girlfriend, false imprisonment, domestic battery by strangulation, and also witness-tampering. The 20-year-old was facing more than a dozen felonies and potentially lengthy prison sentence. The citizens of the great state of Florida have been saved the expense of a lengthy trial and incarceration. Kanye West tweeted out thanking him for being an Inspiration. My Mother once said if you can't say something nice, say it in french. Brûler en enfer Mère Fucker! There is a virulent and ugly undercurrent within rap music. Turn the sound down and watch the imagery in this new video. Labels: America!, Black Lives Matter?? ?